Our babies grow up fast and one big transition for your toddler is moving from their familiar and comfortable crib into a big-kid bed. When should you make the switch from a crib to a bed and HOW? The transition from a crib to a big-kid bed can seem daunting. The bed doesn’t have sides! If your child is not an adventurous climber or escape artist, he or she was “stuck” in their bed. Now, they have the ability to get out of bed easily. This change in the bedroom can often lead to a change in sleep routines. So, I am often asked for advice on how to go about this process. It can be an exciting and emotional all at the same time, as it is a sign that your little one is no longer a baby. When is it the “Right Time” to move from a Crib to a Bed? My answer to the question regarding “when” might seem unconventional. My answer is quite simply, “don’t rush it”. There is no hurry to move your child from their crib into a bed. I have personally seen plenty of toddlers, as old as 3, sleeping happily and comfortably in a crib. These parents have never regretted waiting and did not express to me that they wished they moved their child to a bed sooner. The theory that a child becomes more attached to their crib the longer that they are in it is not true. The older the child is during the time of transitioning to a bed doesn’t correlate with it being tougher. Their age actually can help them understand and own the process more. If you are just beginning the process of sleep training, this is not the time to make a huge change in their bedroom. There is a period of adjustment as your child learns to fall asleep on their own. Keeping his/her bedroom, sheets, crib, and lovie the same is comforting and familiar as he/she masters sleeping independently. 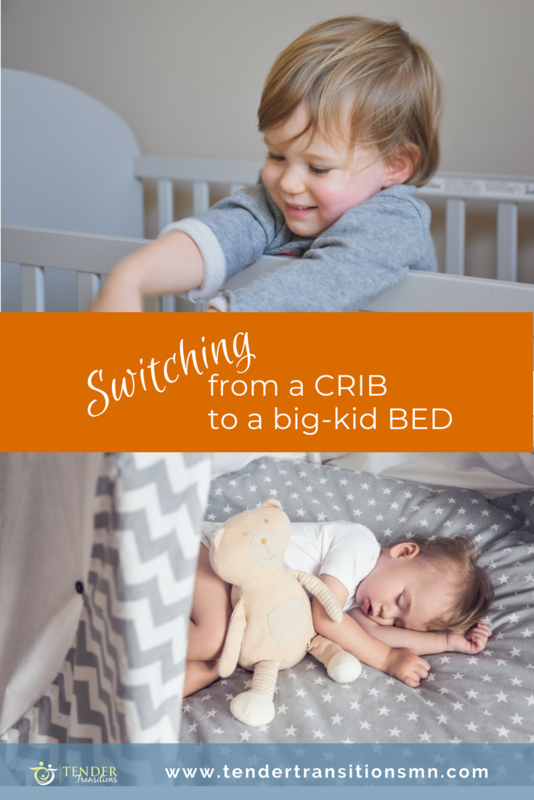 I want to emphasize that switching to a big kid bed is going to be a whole lot easier if your little one is already sleeping through the night. 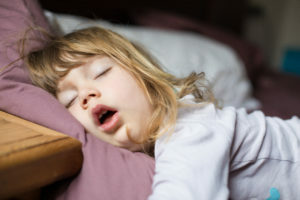 A toddler who is well rested and able to fall asleep independently is far less likely to leave their room at night, which is the single biggest issue that parents run into when they move their little ones out of the crib. If you are thinking of sleep training before making the switch to the big-kid bed, I would love to walk with you through this process, feel free to schedule a chat. Okay, let’s say that you are officially ready for the transition. Your child is falling asleep on their own and through the night. Here are a few tips to help you with the move to the big-kid bed. Just like you give a 5-minute warning when it is time to leave the park, you should fill your little one in on what’s going to happen. Start preparing your child beforehand. Explain that they are going to move into a new bed. Set a date together. Make it a positive experience. However, here is the caveat: you don’t want to make a huge production out of it either! Turning the whole thing into a monumental occasion puts a lot of pressure on your child and is likely to stress them out a bit. We want to make this a positive and comfortable experience. Empower your child in this process by allowing them to make some of the choices. Let your child help pick out her new bed. Make a trip to Ikea or your favorite store and bring your toddler. Be prepared to give your child some specific options, otherwise, you will get requests for the rocket ship bed or the princess castle! Just gently give them a choice between bed A or bed B. You can even have them help pick out the sheets or pick out the pillow that they think is most comfortable. By giving them the ability to choose, it gives your child a sense of ownership which will help ease the transition. You have finally assembled the bed, using the iconic pictures-only Ikea instructions. The sheets are on and everything looks great. I strongly advise that you keep the bed in the same place that the crib used to be. In fact, you’ll want to keep just about everything exactly as it was in your toddler’s room except for the new bed. This is a big change, so try to limit any unnecessary additional changes. This continuity is especially important regarding the schedule on the night of the big transition. Don’t alter your routine. Don’t switch up your bedtime or give him or her a new food at dinner. Put on the pajamas and brush their teeth the same way as previous nights. Keep everything as predictable and mundane as possible. Again, you don’t need to make a production out of this event. You can tell your child that you are proud of them but avoid “What a big boy/girl you are now!”. Toddlers are typically in a perpetual state of uncertainty about whether or not they want to do this whole “growing up” thing, and we want to keep things as low-key as we can. You did it! Your child is in their new bed. However, there are various outcomes to this transition. Outcome 1 -They adapt immediately to their new bed. They don’t test the rules whatsoever. Celebrate! You are among the very lucky minority. 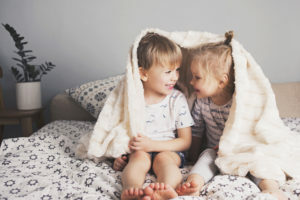 Outcome 2 – Your little one seems to adapt immediately, but, after a week or two, starts leaving their room, playing with their toys, or calling for mom to come back in several times a night. Outcome 3 – Your toddler starts doing all of those things the very first night. The solution to the latter two of these scenarios is the same. Offer a warning when your toddler demonstrates the unwanted behavior, tell them what the consequence is going to be if they do it again, and then follow up on that consequence if and when they repeat it. You have probably already figured out a consequence that works best with your toddler, I encourage you to keep using this consequence. Again, Continuity! The only change is the bed, so keep doing whatever you’ve been doing up until now in order to manage your child’s behavior. If you haven’t figured out an effective consequence, I suggest taking their lovie for a short period of time or closing the door all the way. For each repeat offense, increase the length of time that the door stays closed or the lovie stays out of the bed. 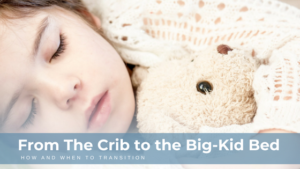 The transition from the crib to the big-kid bed isn’t always smooth, but by explaining the process to your child, creating consistency, setting expectations and enforcing the rules, the transition will be more straightforward. My final advice: You are the parent! You are the boss! There will be resistance. Your little one will ask for that second or third glass of water. They may even ask for to have their crib back. Hold your ground. Keep putting them back in their bed. If you waver and let them climb into bed with you, this transition is going to seem like forever. So, maintain your authority and enforce the rules consistently. Our goal is to have your little one sleeping independently in their own bed. As a sleep coach, I single-handedly get to see and marvel at the restorative nature of a full-night sleep in a family. It is amazing how deep continuous sleep for the whole family improves the quality of family-life and attitudes. If you have any questions or would like to discuss moving your child into a big-kid bed, please use the link below to set-up a time to chat.